Glitter can add sparkle to your day (literally and figuratively). Add some sunshine to that glitter, and you may brighten up your day (and the glitter) even more! Well, how about trying some products from Sunshine & Glitter so you can enjoy the sun and the glitter? I have 4 of their products to share with you. So, read on to find out more. The first product is their Beach Gypsy Glitter Sunscreen, which provides UVA/UVB protection with SPF 30+. And, of course, it comes with glitter! But, not just any glitter—it contains eco-friendly, non-metallic, biodegradable glitter that is free of BPA! And, according to the website, it contains antioxidants and natural preservatives. This sunscreen is available in a 4-oz. container for $24.95 (all prices in this post are subject to change). 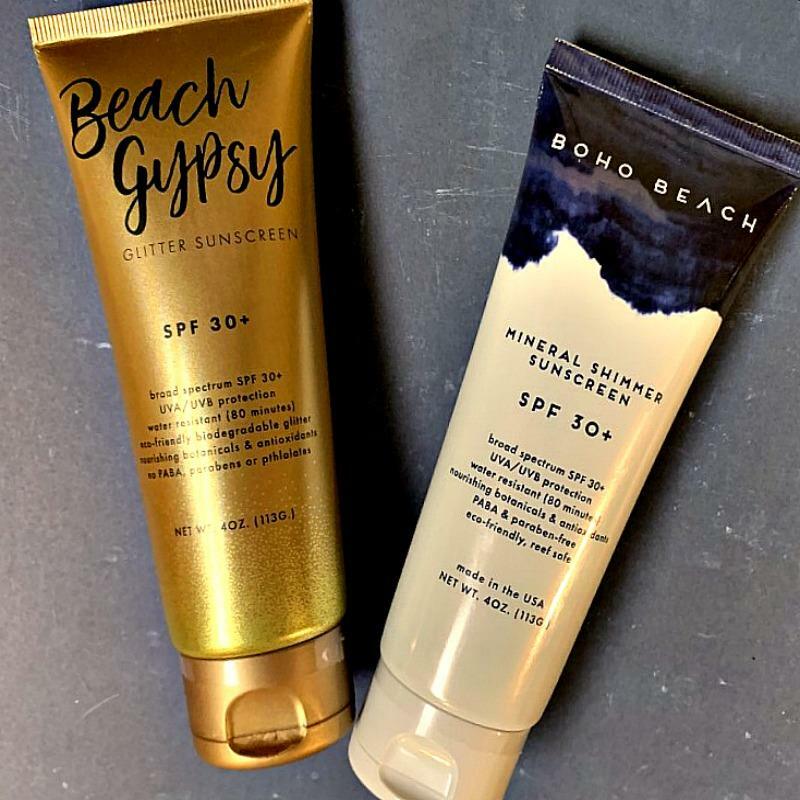 Another cool product from Sunshine & Glitter is their Boho Beach Mineral Shimmer Sunscreen. This sunscreen provides broad spectrum SPF of 30+ and UVA/UVB protection. And, it’s eco-friendly and reef safe! It rubs into the skin easily and leaves a really pretty mineral shimmer on your skin. It also has a subtle pleasant scent. The Boho Beach Mineral Shimmer Sunscreen is available in a 4-oz. container for $24.95. 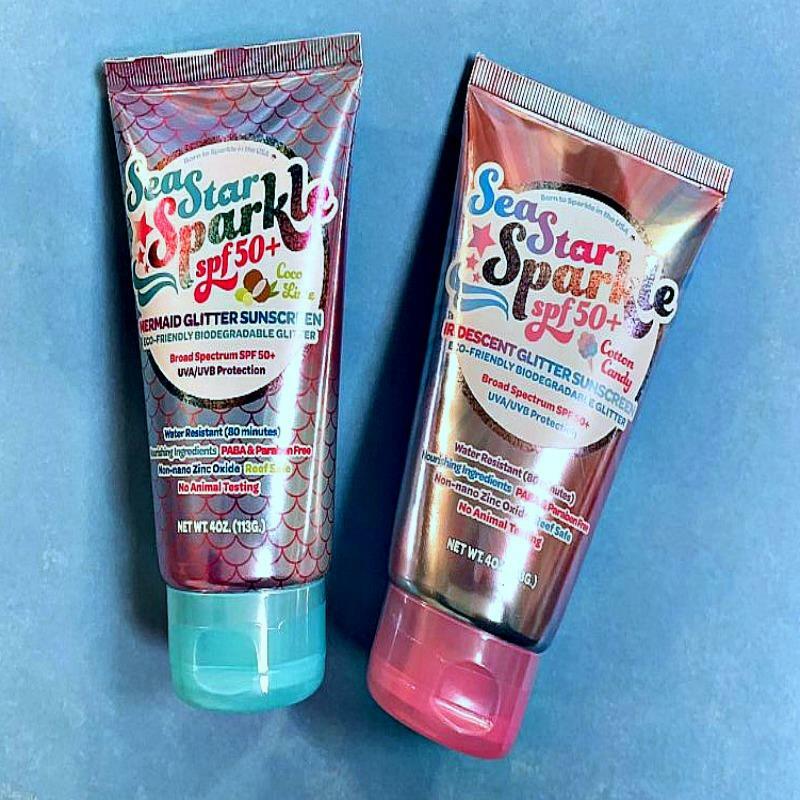 The last two products I’d like to share with you are the Sea Star Sparkle Mermaid Glitter Sunscreen and Sea Star Sparkle Iridescent Glitter Sunscreen. Both of these provide broad spectrum SPF 50+ and UVA/UVB protection. These Sea Star Sunscreens also have fun glitter that is eco-friendly and biodegradable. The Mermaid Sunscreen’s fragrance is coco lime and the Iridescent Sunscreen has a fun cotton candy scent! Both sunscreens are available in 4-oz. containers and retail for $18.95 each. All of the products listed in this post are water resistant for up to 80 minutes. They are also free of PABA and parabens. What I really like about these sunscreens is that they don’t leave any visible white sunscreen layer after being rubbed in, and they are some of the best smelling sunscreens I’ve ever tried. Sunscreen is one of those things that’s always great to have around! So, check out the Sunshine & Glitter website and see all that they have to offer. They make sunscreen that provides protection, while providing you with glamorous, fun glitter!